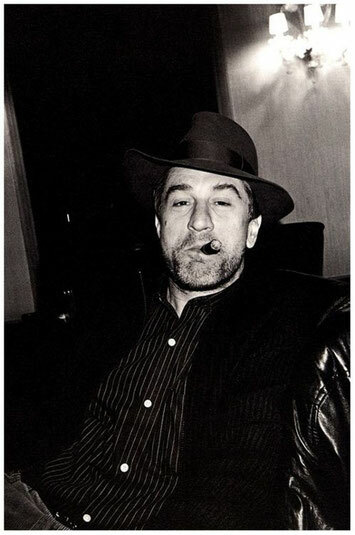 The Great Robert Di Nero smoking a cigar with an effortless style that oozes from his pores. No matter what you wear you have to be comfortable in your own skin. The expression on your face, the sound of your voice, and the way you move your hands are all facets of your own unique style. Own it but more importantly become it by letting your passions guide your sense of style. If you are a cigar smoker then embrace the only line of cigar fashion made by and for cigar smokers. In a Leaf&Barrel #cigarshirt you can be a conservative or fashion forward as you want. The most important thing is that your are wearing a shirt that is custom made to protect your cigars from wear and tear and maintain their humidity. Smoking a cigar is all about relaxation. So relax, reach in your cigar pocket, gently slide out one of cigars you've chosen, pour your glass, and reflect on the day.